Hi, friends! How was your week? Are you as excited as I am that it’s practically the weekend (because Fridays never seem to count as “real” days, do they?)?! Do you have any fun plans this weekend? We’ve had some rainy weather this week, and Kieran and I were cooped up inside all day, so we’re definitely taking advantage of the beautiful weather that is projected for the next few days. As soon as I finish guzzling down this cold brew coffee in my hand, we’re getting ready and heading out to our local park to play/walk before it gets too hot and humid out. Then, I’m hoping we can get some swimming or water play in. The poolside chaise lounge chair and I have a date at nap time today. In terms of food, I’m thinking of keeping things low-key. The last thing I want to do is spend a ton of time in the kitchen when it’s so gorgeous outside. So, we’ll probably have some grilled flank steak, salads, and definitely some caprese on grilled bread. Summer essentials! Oh, and I accidentally bought like 3 lbs of cherries this week (good mistake to make), and I’m trying to figure out what to do with them all!? I am not a fan of pie, so that’s out. Maybe margaritas? We already did mojitos with them last weekend. Any and all suggestions welcome! 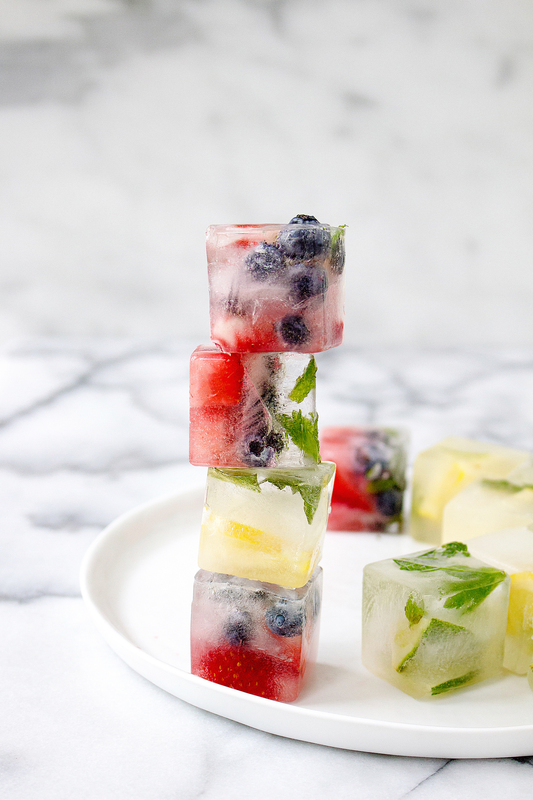 Oh, and see those pretty fruit ice cubes up there? Those have been such an essential this spring/summer so far. I make a big batch every week and we go through them in no time. They’re great in water, lemonade, and even…WINE! Yes! I’ll be sharing more details about them on Instagram later today, so follow along for more! This Vegan Cobb Salad with Coconut “Bacon” looks so intriguing. I wonder if I could get Dan to eat coconut “bacon.” Only one way to find out! These Baked Empanadas look like the perfect easy weeknight dinner. Flaky pastry for life! These will be added to the rotation shortly. This Asian Chopped Salad with Sesame Tofu looks delicious! I love crispy tofu. This Big Green Cobbler looks insane. In a good way. In a “must have now” way. Love the idea of these Strawberry White Chocolate Scones! These may be on Sunday morning’s menu. These Steamed Clams look delish! And I don’t like clams! Leave it to Heidi to make them look appetizing enough for me to want them. These Inspiralized Broccoli Noodles with White Beans & Parmesan look dreamy! Broccoli is one veg I haven’t tried spiralizing yet. It’s next on my list for sure! Also, if you’re looking for a fun, easy appetizer to enjoy this weekend, these Grilled Grape Crostini with Honeyed Whipped Feta are AHHHH-MAAAAZINGGGG. Like, one of the best little bites to come out of my kitchen. Ever. Do it! And finally, last but not least, I must do a shout out to Nicole Culver from Blissful Eats for putting together/hosting the Food Entrepreuneur Summit. I found it soooo incredibly helpful and inspiring and have already started utilizing so many of the tools that were recommended and pieces of advice that were given. I cannot say enough. If you’re interested in growing your own brand (especially in the blog world), you must check it out! The good news is that Nicole has made it available as an online course for everyone! Check it out! There are some seriously inspiring entrepreneurs involved, and I learned so, so much from them. I am so glad I made the investment. I feel like it’s already paying off in spades.